It’s not “cheating” to alter the key of a song, so you can deliver it 100% of the time. While belting is an extremely energized sound, it is NOT singing at the top of your lungs. “Too loudly” or “too high” is “too” much. Original key? Key that’s best for me? What do I do? What to do if the key you have is not a key that you can sing the song in? The advancement of music software has made it pretty simple to change key at will. But is that necessarily the best choice? We all have zones, or sweet spots, where songs sound particularly good in our voices. If you’re at the top of your game, that zone should be substantial. AND you still don’t want to go into an audition or do a cabaret where the song poses a challenge on a day when you’re a bit under. Sing in keys and ranges that work for you. 1)	Text: Does the key suit the text? For example, published versions of Cole Porter’s “Find Me a Primitive Man” are in a soprano range. The text is very sly and seductive (“find me a primitive man… I could be the personal slave of someone just out of a cave”)—lyrics that are much better sung in a lower register to compliment the intentions. 2)	Character: Are you taking the character out of the song by changing the key? Taking Hammerstein’s “Lonely Room”, a song sung by Judd the antagonist in Oklahoma, up a 4th or a 5th would just make the character and his pain sound like a pubescent boy’s whining. On the other side of the coin “Do I Love You Because You’re Beautiful”, the Prince’s song in Cinderella is rather low for the type of young man that usually portrays the prince. Taking the song up a 3rd into the tenor range is stunning on the right fellow. 3)	Key: As you consider the key, examine how the transposition looks: Are there a lot of accidentals? Is it awkwardly placed below or above the staff? Is it in 5 or 6 sharps? Think about the accompanist. Not all transpositions are created equal. So tread carefully as you think about transposing a song for yourself! If it puts the tune in your sweet spot and enhances the character and the text, and doesn’t look frightening, go for it! Ok, just stop and think about it for a minute. Done? Right: the musical theatre literature prior to the 1960’s was based primarily in a “legit” style, unless the character in the musical was there for comic relief, or was an older, light weight character. For example, Ali Hakim in Oklahoma or Nettie in Carousel or Meg in Brigadoon. A ballad is not typically the style these kinds of characters sing in (ok, of course Nettie sings “You’ll Never Walk Alone”, but she’s an usual case). So if there are only a half dozen men’s ballads pre-1965 in The Belt Book, it’s not because we haven’t done our homework, it’s because that’s not how it worked in the Golden Era of the American Musical Theatre. Have suggestions? Let me know! Held in Orlando the end of June started with regional auditions in LA, Chicago, New York and online. Twenty four semi-finalists and six finalists. I am proud of my organization for recognizing Musical Theatre (NATS prefers “Theater”—we’ll have to agree to disagree on this one) as a legitimate vocal performance medium and honoring young artists singing the songs from the only truly American Art form. The final round of competition brought a largely classical audience to it’s feet. The first time ever at a NATS competition! Lively discussion and different points of view about who won and who should have won—creating the opportunity for dialog. There are, of course, kinks to be worked out in the format and execution of this Musical Theatre Competition, but all together a splendid start! I had fully intended to blog every day of this Conference—but it’s been so wonderfully exciting, I didn’t want to miss a moment. The presentations run the gamut of heady pedy (pedagogy) to in the trenches training. All marvelous. The energy of hundreds of people who love to sing and act and share their knowledge and experience has been thrilling. 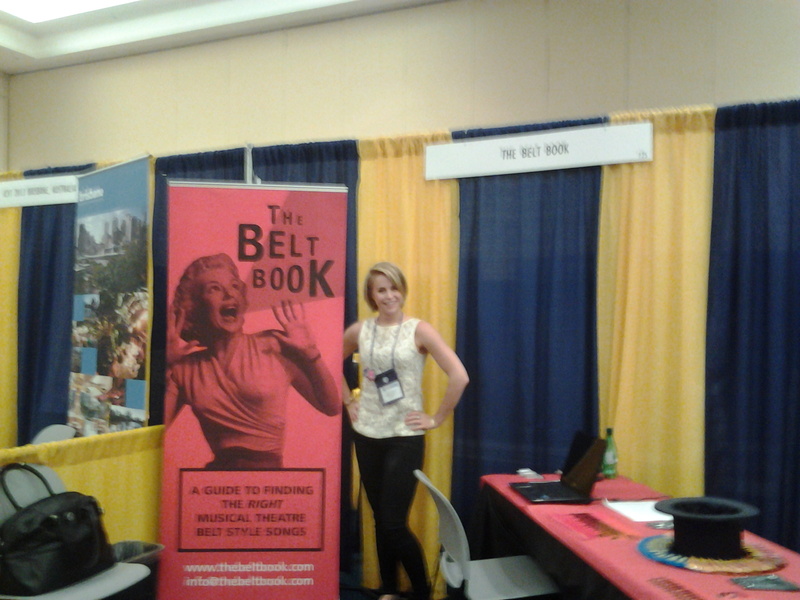 The Belt Book is having it’s formal birthing out of beta, and we’ve been well received. Students, teachers, professors and colleagues have told me that it’s a resource that is needed, and the presentation is very user friendly. There have been so many wonderful colleagues we’ve met from all over the country. Familiar faces, new friends. Quality and quantity .Sunshine for the Seattlites. And it’s just the beginning.